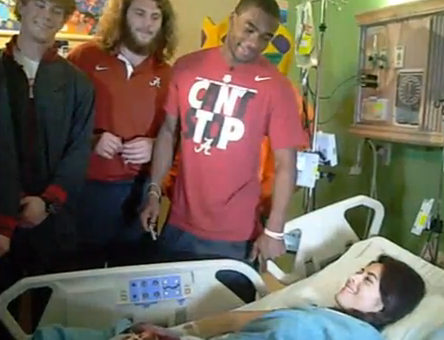 Alabama's football team recently visited the local Children's Hospital. One of the great things now like about Nick Saban's program at Alabama is character development. It's not all about football but it's also about life. Helping those in need even if it's just an encouraging word instills character in these young men that they will carry with them the rest of their life. In the video below there are select members of the 2012 Alabama football team, who are set to play in the BCS National Championship Game against Notre Dame, taking time to visit an area children's hospital. They are pictured giving signed footballs and pictures of Nick Saban.